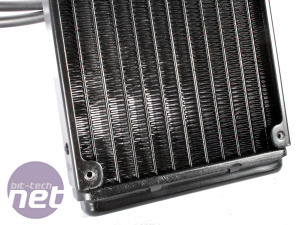 It used to be the case that your CPU was top priority when it came to water-cooling your PC. However, with the latest super-quiet high-end air coolers such as Be Quiet's Dark Rock Advanced able to tame the likes of Intel's Core i5-2500K, even when it's overclocked to 5GHz, it's not surprising that the focus has shifted. 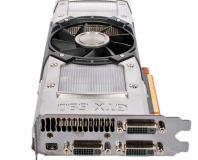 Your graphics card is far more likely to be the noisiest component inside your case these days, and with power consumption at record levels with the current generations of DirectX 11 hardware, given the choice, you could well see far more benefit if you water-cool your graphics card rather than your CPU. The benefits are two-fold - reduced noise (a couple of slow-spinning 120mm fans are far quieter than a stock GTX 580 1.5GB cooler, especially in games) and better cooling, which in turn usually means more overclocking headroom too. Of course, buying a pump, reservoir, tubing, fittings and a waterblock isn't a pleasant experience for your wallet. Even a double 120mm-fan radiator-based setup will set you back £200, and that's before you've done the essential research into the dark arts of water cooling. 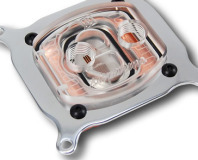 Most water-cooled graphics cards we've seen have simply bolted a third party waterblock to a reference PCB. 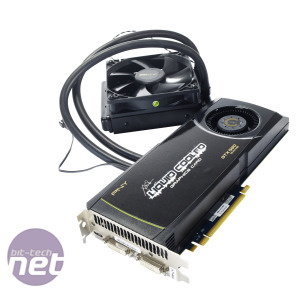 However, PNY has gone one step further and enlisted the help of Asetek to provide a ready-to-use product that should only take a little more time to install than an air-cooled graphics card. 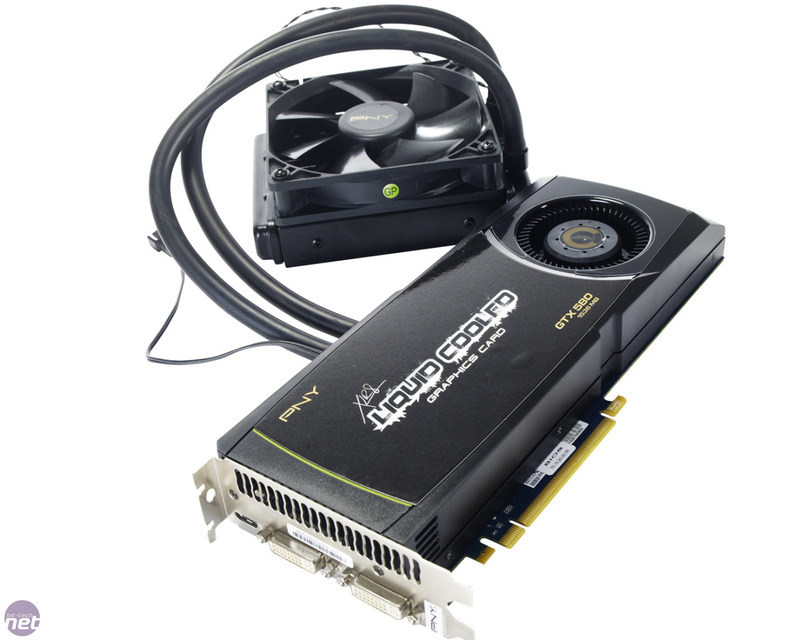 The XLR8 Liquid Cooled GTX 580 OC 1.5GB is equipped with an all-in-one pump, waterblock and radiator in a pre-filled loop that's already attached to the PCB. It's a sealed unit, so there's no filling, bleeding or maintenance of any kind required, and the barbs held up fine during testing, even when we were squishing in the tubing behind the CPU cooler, and the tubing proved very resilient to kinking too. Somewhat bizarrely, the waterblock only cools the GPU - PNY has left the stock cooler in place to cool the rest of the hot spots on the PCB, with the exhaust being directed to the end of the graphics card as normal. A single half-height radiator is included, with a fairly dense array of fins, along with a 120mm PowerLogic PLA12025S12M 1,700rpm fan and screws to mount it (and the radiator) to a nearby 120mm fan mount. 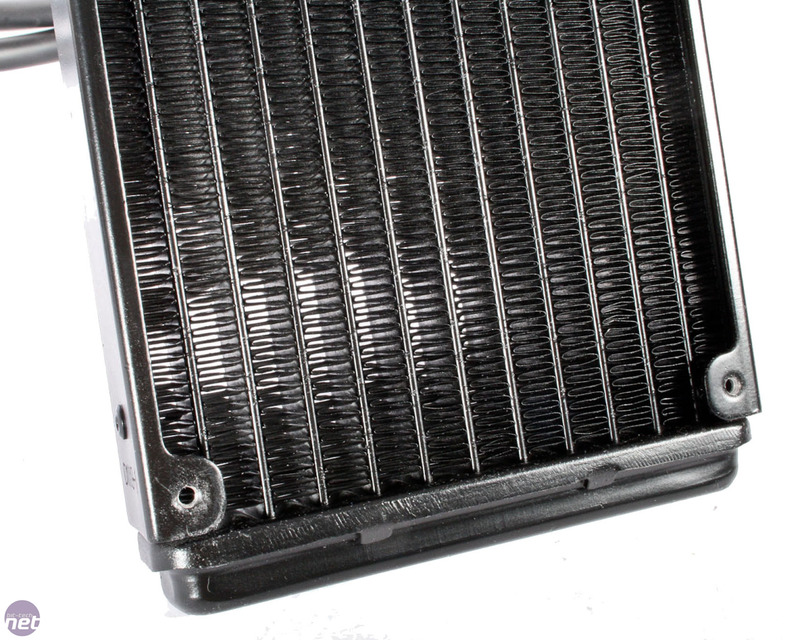 We installed this in the rear exhaust slot of our Antec Twelve Hundred case - this meant drawing in air from the CPU cooler, but the tubing wasn't long enough to allow installation in any other locations. 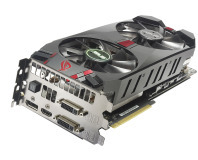 At £439, the XLR8 GTX 580 1.5GB is roughly £60 more expensive than an air-cooled card - this is less than the price of a full-cover waterblock alone, although we'll have to see how well the somewhat skinny radiator deals with an overclocked GTX 580 1.5GB. Speaking of overclocking, PNY has also applied a monstrous overclock to the XLR8 GTX 580. The core speed has been bumped to 857MHz - even faster than the MSI N580GTX Lightning Xtreme Edition. The memory has also been overclocked - to an effective 4.212GHz - again faster than the MSI card. This alone should mean the XLR8 GTX 580 has some serious weight to throw around.